Virtual Serial Port Driver PRO is an effective, comprehensive application that allows for easy management of physical and virtual serial ports. Its ability to customize port parameters and create complex port bundles makes it an ideal solution for many diverse situations. Virtual Serial Port Driver PRO features include the ability to split a single physical COM port into several virtual ports that appear identical to the hardware interface. Physical serial ports and connected devices can be shared by multiple applications. You can redirect data transmission by linking multiple virtual ports to one physical port, allowing your application to receive data simultaneously from all virtual ports through the physical interface. The app supports creation and management of complex port bundles. This allows two-way transmission of serial data by unlimited virtual and physical ports. You can manage hardware control lines by setting a Main Port for both the 'IN' and 'OUT' side of the bundle. Applications that can only take advantage of a limited number of serial ports can use the advanced Switcher feature. This allows several physical ports to be joined into one virtual port. By creating a switcher in your application, your program can use any free serial port when it needs to transmit or receive data. The switcher detects the open ports and offers one to your application. You can also have all ports use the same name and the switcher will provide the same functionality. 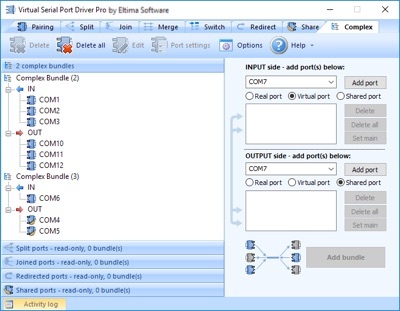 Merging of serial ports is another advanced feature available in Virtual Serial Port Driver PRO. This option allows you to add unlimited physical and virtual serial ports to any single port bundle that has not been divided into 'IN' and 'OUT' sides. This feature enables all devices and applications to simultaneously communicate with multiple devices or applications. All traffic sent to one port is replicated to all other bundled ports, either physical or virtual.